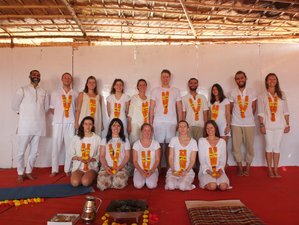 Join Ek Omkar Yoga Center for 200-hour multi-style yoga teacher training course in Rishikesh, India, intended for beginners and intermediate yoga students. It is a great opportunity for the yoga practitioners and passionate yoga lovers to learn yoga from the place of its origin. This yogic culture will help you to gain proper knowledge and learn more about different body types, strength levels, flexibility, and capability in teaching yoga. During the training, you will be staying at either shared or private accommodation. Everything will be prepared for you to enjoy every moment during the training program. Accommodation is equipped with lots of facilities to make the students feel at home. There will be bathrooms, 24-hour water supply, tables and chairs, free Wi-Fi, luggage rack, and 24-hour security guard. The rooms for single occupancy will be available at extra cost. This yoga teacher training will take place in Rishikesh, India. Rishikesh is best known as "Land of Yogis". It is the place of origin of yoga. Every year, a thousand of tourists from all over the world visit the place. This is an awesome destination to spend your spiritual holidays. Many people love to have fun on the Holy Ganges River and many love to practice yoga on this magical land. During the training, you will be served purely vegetarian food three times a day, from Monday to Saturday. Please book your flights to arrive at Jolly Grant Airport (DED). From there, a taxi can be hired to get you to the school. Bookings made at least two months prior to start dates are eligible for an early bird discount of 100 USD per person.